Rogers caught seven of nine targets for 57 yards and ran once for minus-4 yards during Sunday's 16-13 win over Cincinnati. 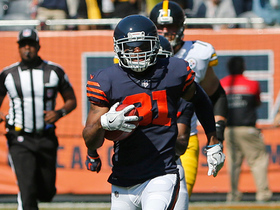 Analysis: A restricted free agent, Rogers spent most of the season on the PUP list, finishing 2018 with 12 catches (on 14 targets) for 79 yards and no touchdowns in three games. The rushing attempt against the Bengals was his first this season. His four-year career has been marred by injuries causing him to miss more games (34) than those he has played (30) and will face stiff competition regardless of the team he plays for in 2019. Rogers caught his lone target for two yards during Sunday's 31-28 loss to New Orleans. Analysis: This was only Rogers' second game this season and he has just five receptions for 22 yards heading into Week 17. The Steelers need to win against the Bengals and have the Browns defeat the Ravens to get in to the postseason. Expect Ben Roethlisberger to continue to focus on Antonio Brown and JuJu Smith-Schuster, making Rogers and most other Pittsburgh receivers poor fantasy options. Rogers brought in all four of his targets for 20 yards in the Steelers' 17-10 win over the Patriots on Sunday. Analysis: Just activated off the PUP list Saturday, the Steelers wasted no time getting Rogers involved. 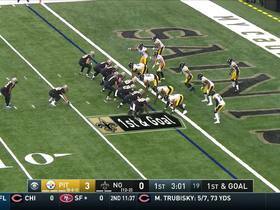 The third-year wideout hauled in a four-yard pass to move the chains on third down on Pittsburgh's first series, and he ended up making another grab in the drive. Rogers could play an important secondary receiver role over the final two games of the season and into the postseason, but he'll have competition for targets from rookie James Washington and Ryan Switzer. Rogers (knee) has been activated off the PUP list, Adam Schefter of ESPN reports. 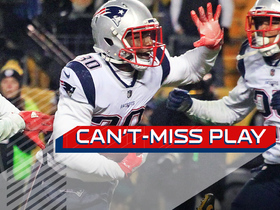 Analysis: It's unlikely Rogers has much of an impact on Sunday's contest against the Patriots, but it's encouraging to see the wide receiver healthy after tearing his ACL during the 2017 playoffs. 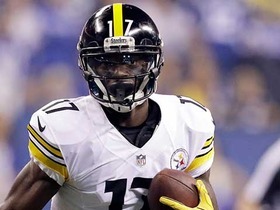 Rogers is expected to slot in behind the likes of Antonio Brown, JuJu Smith-Schuster, Ryan Switzer, James Washington and Darrius Heyward-Bey on the depth chart. Offensive coordinator Randy Fichtner said Thursday that Rogers (knee) looks "healthy" since returning to practice Nov. 28, but he wouldn't commit to the receiver being activated from the PUP list ahead of Sunday's game against the Patriots, Chris Adamski of the Pittsburgh Tribune-Review reports. Rogers (knee) returned to practice Wednesday, opening a 21-day window for the Steelers to add him to the 53-man roster. Analysis: Working his way back from an ACL tear suffered during the 2017 postseason, Rogers needs to be activated or placed on injured reserve by Dec. 19. He recorded 48 catches for 593 and three touchdowns on 66 targets (9.0 YPT) back in 2016, then slipped to an 18-149-1 receiving line on 36 targets (4.1 YPT) last season. It isn't clear where Rogers would fit in an offense that already has JuJu Smith-Schuster and Ryan Switzer doing good work out of the slot. Rogers (knee, suspension) will start the regular season on the PUP list, Ed Bouchette of the Pittsburgh Post-Gazette reports. Analysis: This was always the most likely outcome given that Rogers suffered a torn ACL during last year's playoffs. He'll serve a one-game suspension while he's on the PUP list and will be eligible to return to action once the Steelers come out of a Week 7 bye. The 25-year-old slot receiver profiles as Pittsburgh's fourth or fifth option at wide receiver, but injuries could open up a role in the offense by the time he's ready to play in games. Rogers (ACL/suspension) will likely begin 2018 on the PUP list, Jeremy Fowler of ESPN.com reports. Analysis: Rogers is suspended for the first game of the season and has yet to practice as he continues to recover from a torn ACL, so the move wouldn't be a surprising one. If that's indeed the case, Rogers would be eligible to rejoin the team after a Week 7 bye. Rogers (knee) has been suspended for one game for a violation of the NFL's substance abuse policy, Jeremy Fowler of ESPN.com reports. Rogers (knee) was spotted running sprints on the sideline during the Steelers' practice Wednesday, Jeremy Fowler of ESPN.com reports. Analysis: After re-signing with Pittsburgh on July 25, Rogers was immediately placed on the Physically Unable to Perform list while he continues to recover from the ACL tear he suffered in mid-January. His presence on the field running in a straight line marks significant progress, but there weren't any signs of Rogers incorporating any change-of-direction work during the session. His availability for the start of the regular season remains a question mark. Rogers (knee) will be placed on the Steelers' Physically Unable to Perform list, Ray Fittipaldo of The Pittsburgh Post-Gazette reports. Analysis: This news came just hours after Rogers re-signed with the Steelers, who will evaluate where he is in his rehabilitation from January ACL surgery. Once he's cleared, he'll compete for depth slotting behind starting wideouts Antonio Brown and JuJu Smith-Schuster. Rogers (knee) agreed Wednesday to re-sign with the Steelers on a one-year contract, Adam Schefter of ESPN reports. Rogers (knee) left Kansas City without a contract and will now visit the Browns, Field Yates of ESPN reports. Analysis: Still rehabbing from Jan. 17 surgery to repair a torn ACL and meniscus, Rogers initially was expected to re-sign with the Steelers but is instead weighing offers from multiple teams. He faces an uphill battle to be ready for Week 1 -- and perhaps an even tougher battle to earn a meaningful role wherever he ends up signing. The 25-year-old slot receiver averaged 9.0 yards per target on 66 looks in 2016, but he dropped off to 4.2 YPT on 36 chances last year. Rogers (knee) suggested Wednesday on his personal Twitter account that he's nearly recovered from a torn ACL and that he expects to sign with a team in the near future. 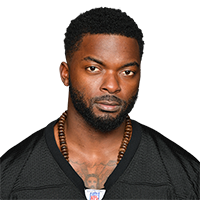 Steelers coach Mike Tomlin said Rogers' recovery from a torn ACL will be "critical" for the Pittsburgh offense, Jeremy Fowler of ESPN.com reports. Rogers (knee) won't be tendered a contract by the Steelers, and he will become an unrestricted free agent on Wednesday, Ed Bouchette of The Pittsburgh Post-Gazette reports. Analysis: Rogers played in 13 games for the Steelers in 2016, hauling in 48 passes for 594 yards (12.12 YPC) and three touchdowns. However, with the arrivals of JuJu Smith-Schuster and Martavis Bryant in 2017, Rogers was demoted and snagged just 18 throws for 149 yards (8.28 YPC) and one touchdown. Rogers also underwent surgery for a torn ACL in January, but he hasn't been ruled out for 2018 training camp yet. Rogers (knee) is off crutches, according to his personal Twitter account. Analysis: Rogers underwent surgery to repair a torn ACL on Jan. 17 but seems to quickly be making progress. It was originally believed the wideout would be questionable for the start of the 2018 season, but now there's a chance he'll be back on the field in time for training camp. Look for more updates on his status to come throughout the offseason as he continues his rehab. Rogers (knee), who underwent surgery Jan. 17 to repair the ACL and meniscus in his right knee, remains on crutches but is expected to recover within 4-to-6 months, Dave Lolley of DK Pittsburgh Sports reports. Analysis: The original thought was that Rogers could be in danger of missing the start of the 2018 season given the typical 9-to-12 month recovery timeline for ACL injuries. However, it now seems possible he could return in time for training camp in late July or early August, depending on which team the impending restricted free agent ultimately signs with this offseason. Rogers (knee) underwent surgery to repair his torn ACL on Wednesday, ESPN's Adam Schefter reports. Analysis: Rogers, who suffered the devastating right knee injury during the Steelers' divisional playoff loss to the Jaguars, will be a restricted free agent this offseason as he deals with a lengthy road to recovery. Pittsburgh could be without its slot receiver for the beginning of the 2018 regular season if it elects to re-sign Rogers, given the nine-to-12 month timetable that usually accompanies a torn ACL. Rogers was diagnosed with a torn ACL, Gerry Dulac of the Pittsburgh Post-Gazette reports. Analysis: Rogers went down with a previously undisclosed right leg injury on the final drive of last Sunday's divisional-round loss to the Jaguars. Since ACL injuries usually command a nine-to-12 month recovery, the 25-year-old receiver will likely miss all of OTAs and training camp recovering and isn't guaranteed to be ready in time for the 2018 season opener. Rogers suffered a lower right leg injury late in Sunday's 45-42 divisional-round loss to the Jaguars and was unable to return, Chris Adamski of TribLive.com reports. Rogers caught all five of his targets for 42 yards in Sunday's 45-42 AFC divisional-round loss to Jacksonville. Analysis: Rogers goes out on a high note, with more receptions than in any game during the regular season. He seems to save his best for the playoffs, averaging nearly five catches and 39 yards in four games, compared to an average of two catches and 29 yards in 27 regular-season games. With the wide receiver talent on the Pittsburgh roster, Rogers' fantasy value currently seems to have a low ceiling. Rogers caught his only target for one yard in Sunday's 28-24 win over the Browns, finishing the 2017 season with 18 catches (on 36 targets) for 149 yards and one touchdown. He also added 11 yards on two punt returns, giving him 146 yards on 19 punt returns in 14 games. Analysis: Expectations were a bit higher than Rogers was able to deliver this season, and the restricted free agent will face stiff competition from a deep group of receivers heading in to 2018. Rogers brought in one of two targets for an 18-yard touchdown in Sunday's 27-24 loss to the Patriots. 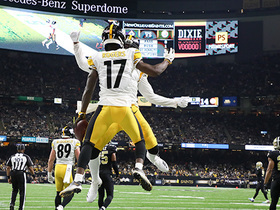 Analysis: Rogers corralled a nifty first-quarter scoring throw from Ben Roethlisberger, tying the game at 7-7 at the time. The second-year wideout hasn't logged more than three receptions in a game since Week 2, so despite notching his first touchdown of the season Sunday, he retains minimal fantasy value. 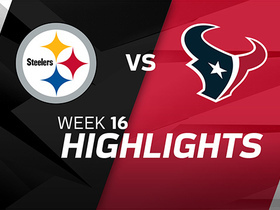 Rogers totaled 21 yards on three receptions in Pittsburgh's 31-28 win over Green Bay Sunday night. Analysis: Rogers seven targets matched his season-high, and was one more than Martavis Bryant, but resulted in another poor outing. The increase in targets can likely be attributed to the absence of JuJu Smith-Schuster (ankle, inactive), but even if Smith-Schuster is unable to go in Week 13 against the Bengals, Rogers' fantasy value is negligible. Rogers is expected to have a larger role in the Steelers' game plan Sunday against the Packers with JuJu Smith-Schuster (hamstring) ruled out for the contest, Chris Adamski of TribLive.com reports. 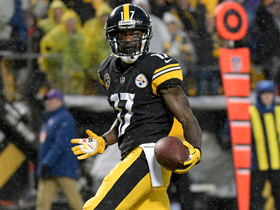 Rogers had one reception for two yards in Pittsburgh's 20-17 win over Indianapolis Sunday. Analysis: Since grabbing six passes for 54 yards in the first two games of the season, Rogers has just two receptions for 12 yards. There are just too many better options in the passing game at the moment. Pittsburgh Steelers quarterback Ben Roethlisberger finds his open wide receiver Eli Rogers for the two-point conversion. Steelers' fake spike backfires, Big Ben throws end-zone interception. Pittsburgh Steelers wide receiver Eli Rogers runs in 18-yard TD. 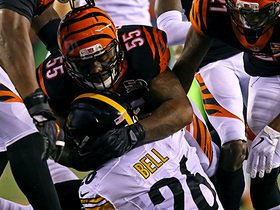 Cincinnati Bengals linebacker Vontaze Burfict and Pittsburgh Steelers Le'Veon Bell reignite rivalry after cornerback Adam Jones' interception. Green Bay Packers cornerback Damarious Randall intercepts Pittsburgh Steelers quarterback Ben Roethlisberger's pass intended for wide receiver Eli Rogers. The "GameDay First" crew discusses how Pittsburgh Steelers wide receiver Eli Rogers will impact the teams offense.